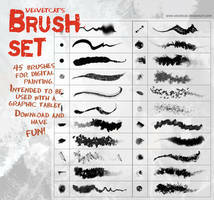 This brush pack is designed as a total replacement for your current set. 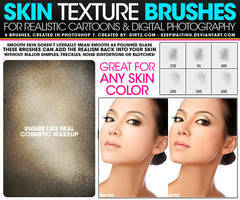 Or at the very least, designed to be inserted at the top of your list of brushes as an essential starting collection. 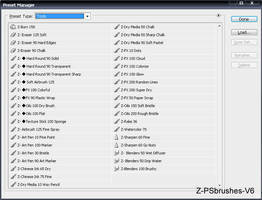 - This is now an extended version of the older V2 set, (from 1.8MB now to 32MB,) containing the brushes I use often in my day to day Photoshop drawing and painting. - Things to note: a few brushes have been removed because I never used them due to their rather uselessness. The "Knife" brushes in particular have been removed, and replaced by "Broad Tip 1 & 2" under the Flats Set. - A fantastic painting set "Triangle Brushes" by Joshua James has been added to the Painting section, and I've been using these on almost everything since I found them. 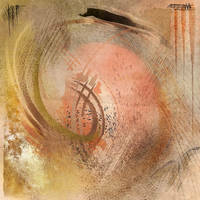 - Also new are a bunch of sponge / spatter brushes I've been using often as texture bases to painting. Useful! 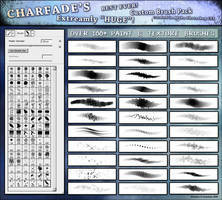 - The Chalk brushes are also a pretty essential part of Photoshop in general, so I've added a section just for them. I borrowed an organizational method here that I saw Feng Zhu use in his videos. 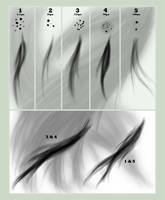 Create numbered brushes that go at the start of each row. (Note these number brushes are not supposed to be used.) They divide the brushes into the sections seen above in the preview, that way you quickly know which section you're in while browsing in icon view. The trick, however, is that you have to resize your brush window to the correct width to place all the numbers on the left-most column. The blank 1px brushes are merely spacers. They contain no brush data. These can always be swapped out for your own brushes you'd like to add to those sections, if you like, or duplicate them to make full rows just in case things aren't lining up evenly. 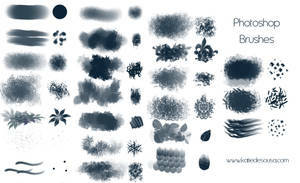 Many of the brushes in this set have been made by me, but a good number of them have also been downloaded or shared to me by friends. I don't have all of the credit information for them. 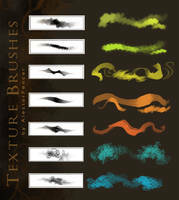 I've labelled brushes in the set with proper credits to their creators as I know of them, but if you see a brush of yours in here and it isn't credited to you, let me know! Enjoy this new set, it improves greatly on the old set while remaining easy to navigate thanks to organizing it all. 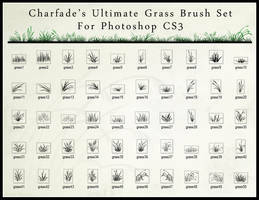 "What are the Sponge and Foliage brush sets? 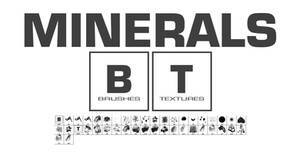 Those seem pretty specific-purpose for a general tool-kit." The entire foliage set was a set I created myself as I often found the need to quickly block-out tree/bush-shaped objects. 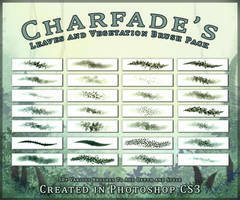 These brushes have uses outside of just creating foliage, however. 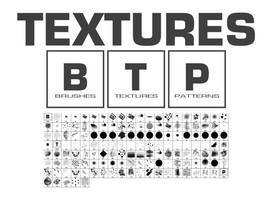 They can be very useful for creating alpha masks for trees and plants in matte compositing and other applications where broken-up edges are needed for visual expression. 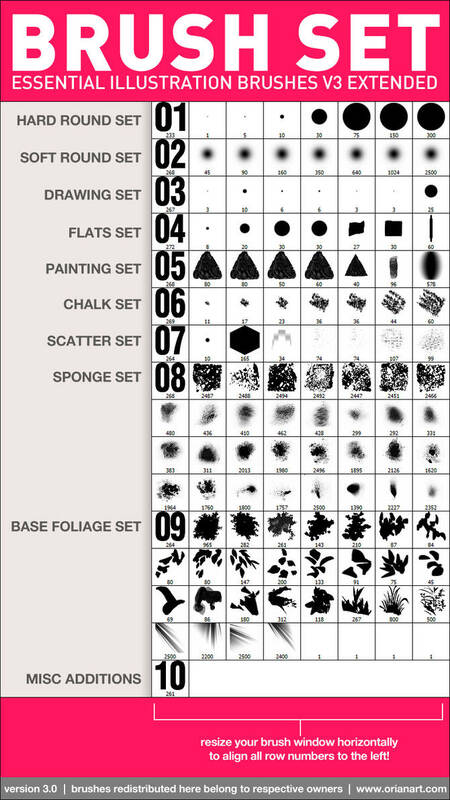 The sponge set is a few borrowed sets I assembled that are great for adding speckle, spatter, and quick grunge effects for illustration, graphic design, alpha masks or matte as well. Still looking for the lighter weight old version? Download it at the link below! Let's be real for a minute here. Just don't worry about it. These brushes are just tools. They are not copyrighted or infringe-able. 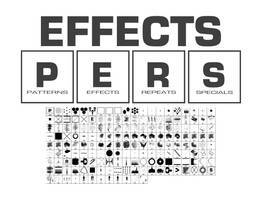 What you create with them becomes copyrighted only to yourself. This is wholly free. You do not need to credit me. 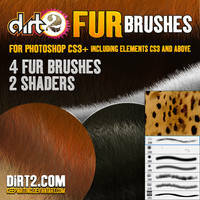 You can feel free to link people to these brushes if you want, but don't feel obligated to credit me as the provider to make your work possible. I was not responsible, you and your skill are responsible. Think of it this way: would you write a note to Utrect, Steadtler, Faber-Castell etc to ask if it's OK to use their line of pencils, pens, and markers to make your art? No, you wouldn't, and this brush set is no different. Have fun, and create! Ahhhhhh I love those plants and sponges. Has anyone converted these for Manga Studio at all? Im gonna weep ty so much for this. OTL all the other brush packs make you give credit in every single drawing and like- i understand linking back to the original page but??? every time you draw it?? pls no QnQ this is perfect!! Thank you so much!. I'm gonna try them right now! Splendid, thank you very much for creating these! I wanna say thank you very2x much..I won't say anything how I really need this.. 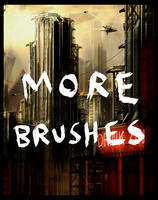 These are great brushes.Ill make good use of em. Also keep up the good work on your illustrations. these are great! thank you very much!! As Luna-Hawke said down there, that is an excellent description. I can see why people would charge for brushes, as they do take effort to make. But beyond that, the person who uses the brushes shouldn't need to credit the brush maker like the brush maker made the art themselves. 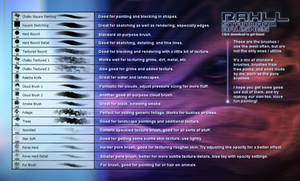 I'll definitely recommend this to my art buddies. Downloaded it. Thanks for the share ! Thank you so much,it looks really handy. Can this be used in FireAlpaca?